Alton Brown’s views on kitchen tools have played an important role in shaping our Culiniste recipes: you should be able to cook a great meal with nothing more than a good knife and a solid pan. For those of us who are interested in investing in a bit more hardware, our guiding principle is simple – don’t buy anything that’s only good for a single task. Unitaskers are generally easy to spot (melon baller anyone? ), but in some cases there’s more than meets the eye. 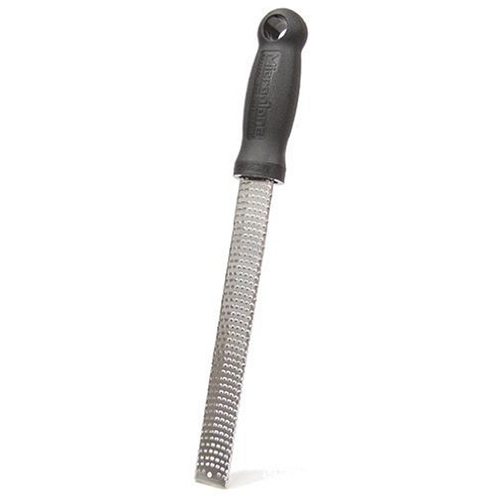 Take the humble zester – better known for zesting citrus or grating cheese, but how about using it to speed up your mise en place? Skip the mincing and simply run some ginger, garlic, shallot or onion through your zester – you’ll get a fine uniform pulp in a matter of seconds that will cook perfectly evenly. Rustle up a quick salsa with grated tomato pulp, or make homemade breadcrumbs by grating toast. Take a look through the recipes this week and see what else you can stick to the mighty zester – it’s much more than just a cheese shredder! Though they do make the job of cleaning a zester much easier, dishwashers can dull blades. Avoid putting your zester in the dishwasher. We pride ourselves on giving you the perfect quantities of everything you need in your Culiniste box. Onions, however, can be the exception! A full onion is often too much for any given recipe – so we leave the judgment call in your capable hands.